Lead the Way is working in conjunction with Stop Hate UK to offer an awareness raising workshop for adults with a learning disability in Calderdale. 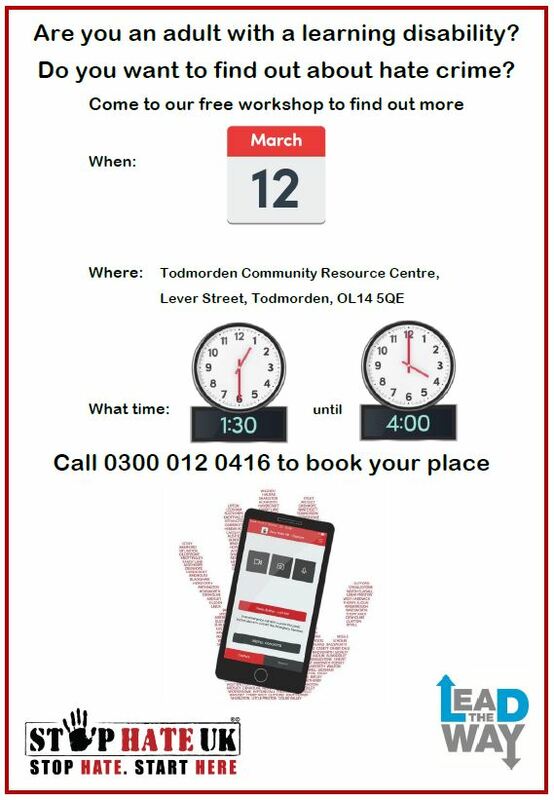 The workshop is being held on Tuesday 12 March, 1:30pm-4:00pm at Todmorden Community Resource Centre, Lever Street, Todmorden, OL14 5QE. The aim of the workshop is help people to identify when hate crime or harassment is happening and to be able to report incidents. There are a limited number of spaces for the workshop so book now by contacting Natalie at natalie.ratner@cloverleaf-advocacy.co.uk or by calling 0300 012 0416.